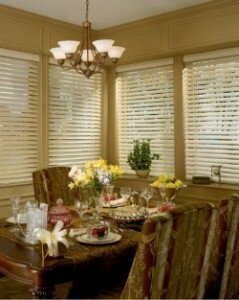 Covington Blind and Shutter Company offers a large selection of top quality Blinds, Shades and Shutters. We have over 16 years of experience and can offer the most comprehensive advice to help you choose the window coverings that match your needs and tastes. All of our products are manufactured in the USA. You can be sure your project will be on time and within budget when you select Covington Blind and Shutter Company for your window and door covering needs. Wood Blinds are available in 1-inch, 2-inch and 2½ -inch wide slat sizes, in a full range of finishes. They are a great classic choice for those seeking the beauty of real wood and the practicality of horizontal window blinds for their window treatments. Faux Wood Blinds are made with a synthetic material that has the look and feel of natural wood but are lighter and more economical. The unique formulation captures all of the warmth and beauty of real wood but is actually stronger, harder and far more water resistant. Our Faux Wood Blinds are 100% ultraviolet controlled, which means they will not yellow. You will not have to worry about warping or cracking. Faux Wood Blinds are a great product for areas of high moisture or humidity, such as bathrooms and laundry rooms. Our Faux Wood Blinds are available in 2-inch and 2½- inch slat sizes, in a range of colors and wood tones. 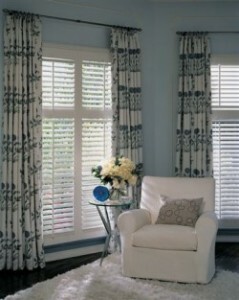 Vertical Blinds are made of vinyl, fabric or both (inserted vanes). Verticals are easy to use, are low maintenance and offer the advantage of very effective light control. Particularly well-suited for large windows and sliding glass doors, vertical louvers can be rotated to control glare, closed for complete privacy or can be drawn open for an unobstructed view. We use only the best materials to fabricate the blinds we sell. We also offer a large variety of Horizontal Blinds, Mini Blinds and Aluminum Blinds. Cellular Shades are made of non-woven soft fabric that creates a honeycomb “cell.” These cells trap air for maximum energy efficiency and sound reduction. Cellular Shades offer distinctive smooth and textured fabrics from sheer to opaque, in a single or double cell construction. They offer varying degrees of light control and privacy and are easy to clean. You can choose from a variety of lifting systems including a roller clutch lift and a child-safe cordless lift system. Roman Shades offer gorgeous patterns ideal for many of today’s décor styles. They’re perfect for pairing with draperies and are available in light filtering or room darkening. Woven Wood Shades let you bring the splendor and beauty of nature indoors. With unique grasses, reeds and bamboos, Woven Woods are essential elements in today’s home décor styles. Shutters bring you the warmth of classic southern style in 2½- inch, 3½- inch and 4½-inch louvers. The panels with louvers are hinged to a frame that is mounted directly to the window frame or wall. Shutters are available in wood or faux wood. They are available in a wide assortment of custom specialty shapes and can be matched to almost any color for a custom designer look. We frame our shutters to provide an elegant look, superior to hang sticks normally used throughout the industry. Covington Blind and Shutter Company offers repair service for both residential and commercial locations. We specialize in repairing most types of window treatments, including wood blinds, honeycomb, pleated shades and verticals. We perform most repairs at your home or office in just a single trip. Name Brand Manufacturers at Low Prices!